Postsynaptic Density protein 95 (PSD95), also known as Synapse associated protein 90kDa, is a member of the membrane-associated guanylate kinase (MAGUK) family of proteins. 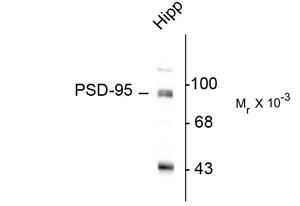 PSD95 is a scaffolding protein and is involved in the assembly and function of the postsynaptic density complex (1). These family members consist of an Nterminal variable segment followed by three aminoterminal PDZ domains, an upstream SH3 domain and an inactive carboxyl-terminal guanylate kinase (GK) domain. The first and second PDZ domain localize NMDA receptors and K+ channels to synapses, and the third binds to neuroligins which are neuronal cell adhesion molecules that interact with b-neurexins and form intercellular junctions. PSD-95 also binds to neuronal nitric oxide synthase, possibly through interactions between PDZ domains present on both proteins (2). Thus different PDZ domains of PSD-95 might be specialized for distinct functions (3, 4). PSD95 participates in synaptic targeting of AMPA receptors through an indirect manner involving Stargazin and related transmembrane AMPA receptor regulatory proteins (TARPs) (5). The protein is implicated in experience dependent plasticity and plays an indispensable role in learning (6). Mutations in PSD95 are associated with autism (7). 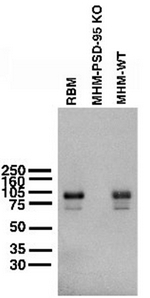 DLG4 polyclonal antibody (A01), Lot # 051108JC01 Western Blot analysis of DLG4 expression in Y-79 ( Cat # L042V1 ). 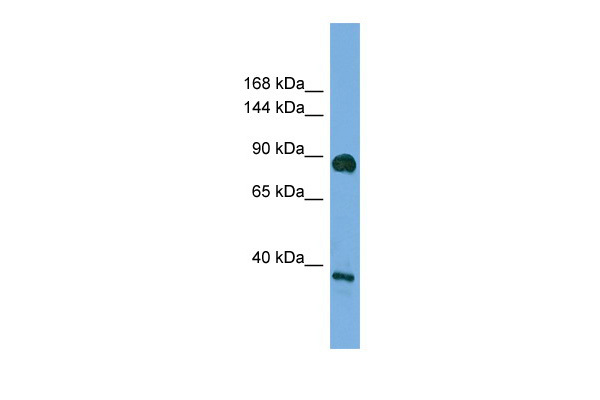 Western Blot analysis of DLG4 expression in transfected 293T cell line (H00001742-T02) by DLG4 MaxPab polyclonal antibody.Lane 1: DLG4 transfected lysate(85.40 KDa).Lane 2: Non-transfected lysate. Western blot of rat hippocampal (Hipp) lysate showing specific immunolabeling of the ~95k PSD-95 protein. 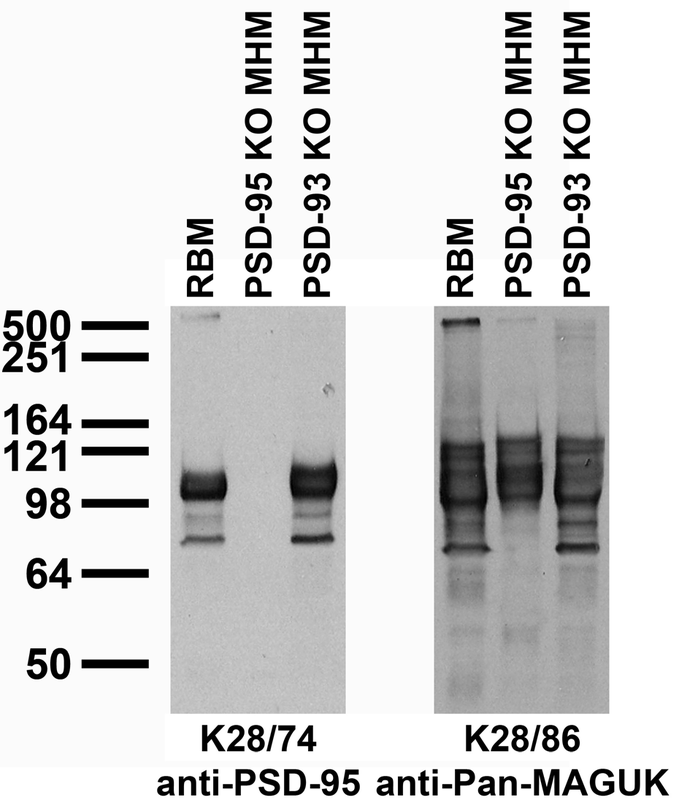 Using PSD-95 polyclonal antibody ( Cat # PAB9623 ). 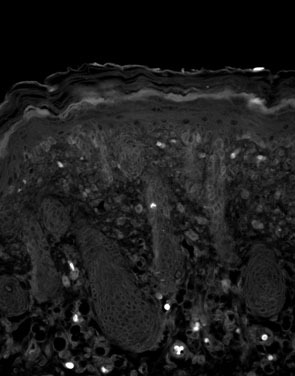 ICC localization of Psd95 in rat neocortex. PSD-95 western blots of adult rat brain membranes (RBM), and adult mouse hippocampal membranes (MHM) from PSD-95 knockout and WT mice (mouse samples courtesy of Dr. Richard Huganir). 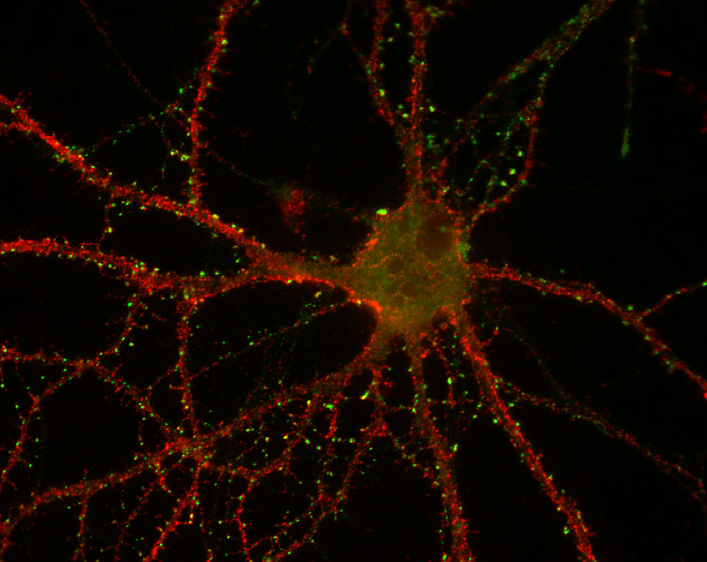 PSD-95 (green) and Kv4.2 (red) staining of rat hippocampal neurons. 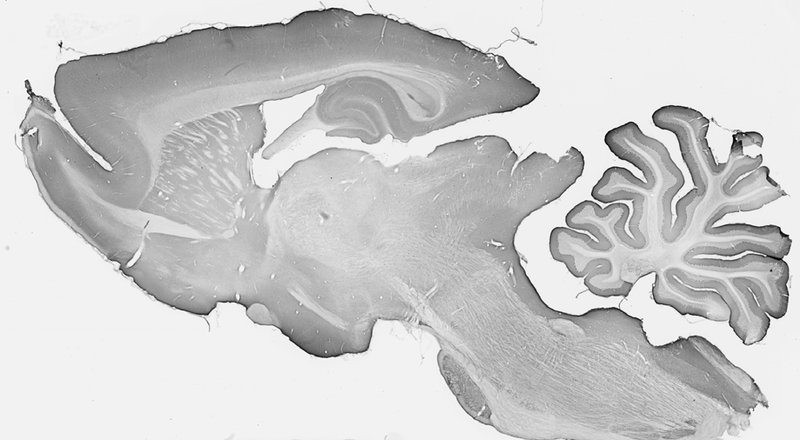 Electron micrograph of K28/43 hippocampal labelling using a post-embedding immunogold method. Immunoparticles (arrows) are seen in the postsynaptic densities of dendritic spines (s) forming asymmetricalsynapses with axon terminals (b). Scale bar = 200 nm. Image courtesy of Rafael Lujan (Universidad de Castilla-La Mancha). 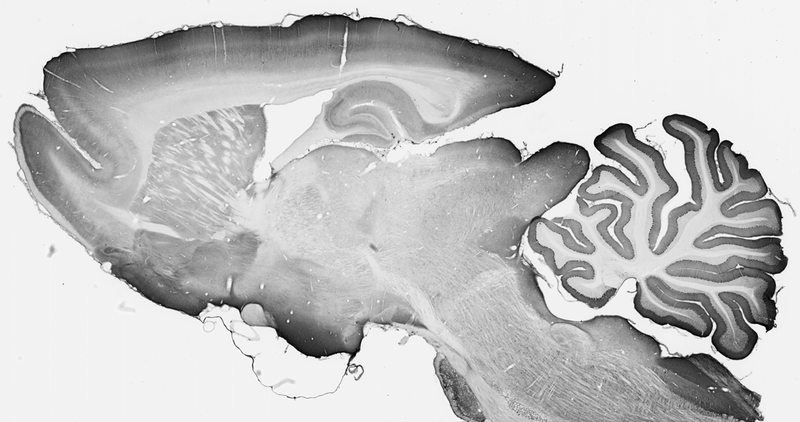 Immunoblot against adult rat brain membranes (RBM) and adult mouse hippocampal membranes (MHM) from PSD-95 and -93 knockout (KO) mice probed with K28/43 (left) or K28/86 (right) TC supe. Mouse samples courtesy of Richard Huganir (Johns Hopkins University, Howard Hughes Medical Institute). 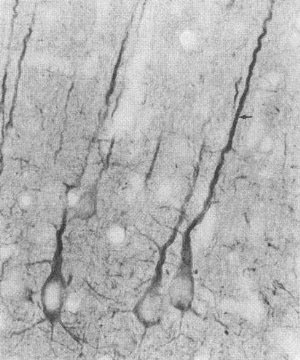 Electron micrograph of K28/43 hippocampal labelling using a post-embedding immunogold method. 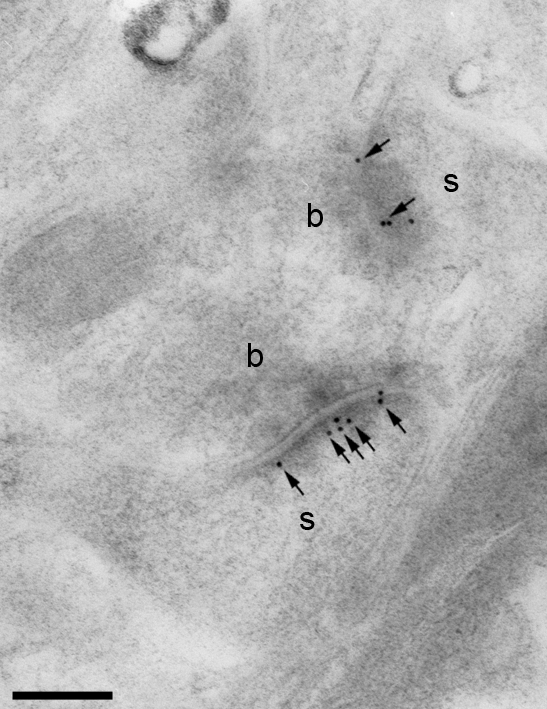 Immunoparticles (arrows) are seen in the postsynaptic densities of dendritic spines (s) forming asymmetrical synapses with axon terminals (b). Scale bar = 200 nm. Image courtesy of Rafael Lujan (Universidad de Castilla-La Mancha). 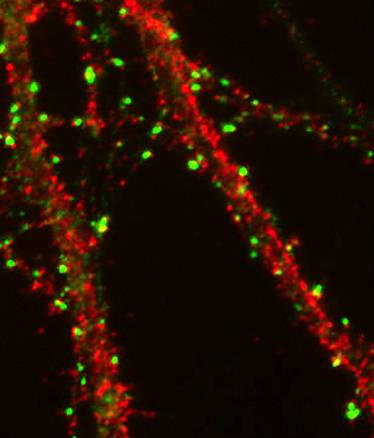 immunofluorescence staining of cultured rat hippocampal neurons with K28/43 (green) and K57/1 (red, Kv4.2), right image is higher magnification of left image (dotted lines). 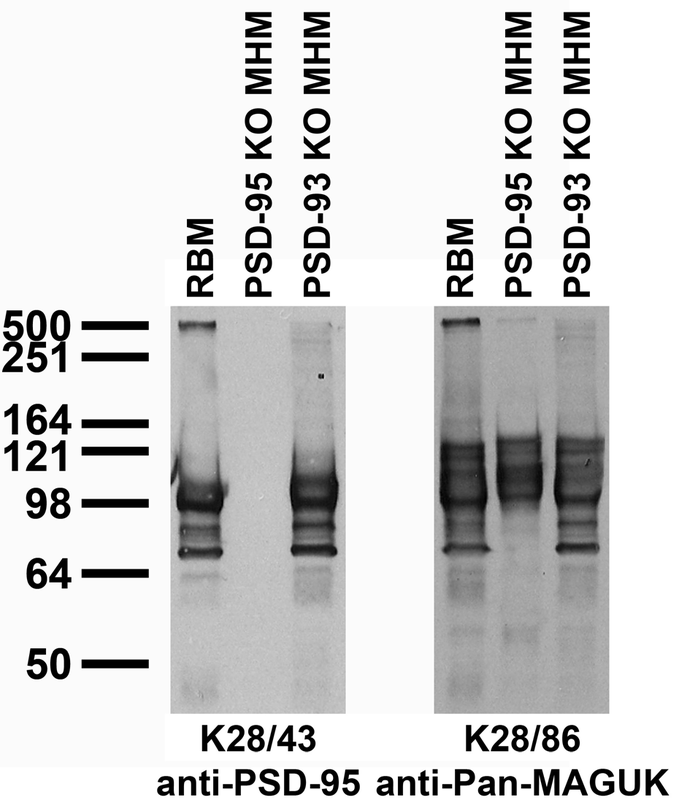 Immunoblot against adult rat brain membranes (RBM) and adult mouse hippocampal membranes (MHM) from PSD-95 or PSD-93 knockout (KO) mice probed with K28/74 (left) or K28/86 (right) TC supe. Mouse samples courtesy of Richard Huganir (Johns Hopkins University, HHMI). 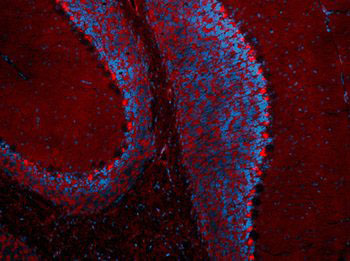 Immunofluorescence of human frontal cortex with K28/74 (green), rabbit Synapsin-1 (red) and DAPI (blue). Twelve images from 100 nm sections (left) were volume-reconstructed via array tomography (31.5 x 34 x 1.2 µm, right). Image courtesy of Nancy O’Rourke, Nafisa Ghori and Stephen Smith (Stanford). 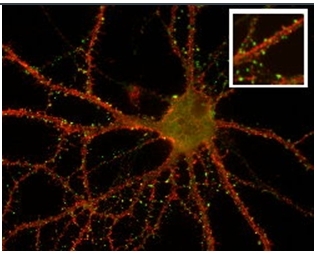 Anti-DLG4 antibody (0.3µg/ml) staining of Mouse Brain lysate (35µg protein in RIPA buffer). Primary incubation was 1 hour. Detected by chemiluminescence. Western blot of rat hippocampal (Hipp) lysate showing specific immunolabeling of the ~95k PSD-95 protein. 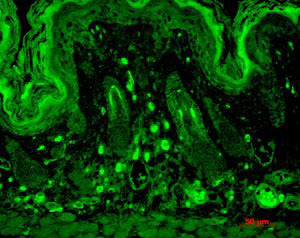 IHC analysis of Pan-MAGUK using TA309458 in mouse backskin sections. IF of PSD95 in cultures of dissociated hippocampal neurons. Cultures were grown and labeled with antibodies against the indicated proteins. 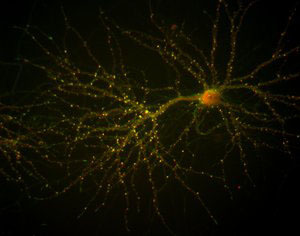 A neuron double stained for PSD95.